Yesterday was our anniversary. Where did we spend our day? In the town known by many names, including Buffalo City and Queen of Cowtowns: Dodge City, Kansas. It was as long of a day trip from our campground as we’d care to make, but not knowing when we might be near again, Jim and I decided to make the trip there. So as not to worry about being gone from Chewie for too long or not being able to do what we’d like to do because he was with us, we arranged doggy daycare with a Rover.com caregiver. Chewie had a fun time with Lauren, Mark and their two dogs, and we had a great Dodge City anniversary date. First on the agenda was lunch, and evidently we chose well. Jim and I enjoyed the atmosphere, food, and service at Casey’s Cowtown Steakhouse and Club. Since it was lunch and we’d be out and about in the heat, both of us opted for charbroiled burgers (yummy ones) instead of steaks that we might have gotten had it been dinner. Next, we drove to Boot Hill. Yeah, it’s a cheesy tourist trap, but it is also filled with lots of interesting information about the land from the time when Native Americans and millions of buffalo (American bison) roamed freely up through present day. Of course, one enters and exits through the gift shop. Lucky for us, we are no longer tempted to buy much since we live in an RV, and we send the grands postcards now and then rather than buying junk they don’t need. After getting our tickets, we watched an introductory video before heading toward the museum, passing by the jail. 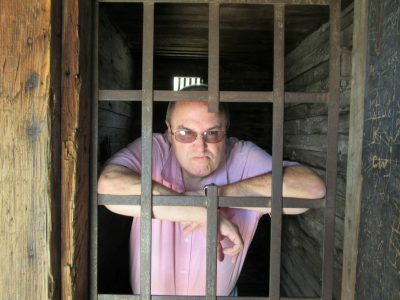 Of course, I had to put the hubby behind bars for the heck of it. Hubby is grimacing about being in jail. Jim went up to the cemetery, which is above the People of the Plains Museum. If I understood correctly, the cemetery used to be much larger than it is today, but he found a few interesting markers. Here’s one. 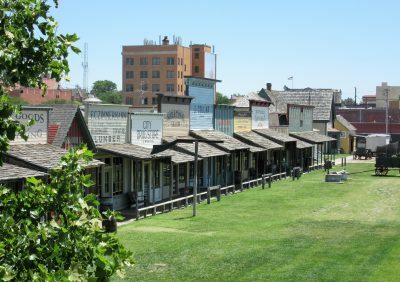 After that, he and I went down to “Front Street” to explore what was inside the replica of the original street from Old Dodge City, built using photos made back during its infamous days. One thing that Jim and I realized during our perusal of the exhibits inside the on Front Street buildings is that Wyatt Earp was never a marshal or a sheriff. 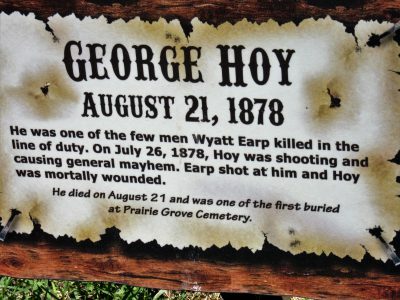 Despite how he is portrayed as lawman by Hollywood, Earp only served as assistant marshal twice and as a deputy sheriff once. 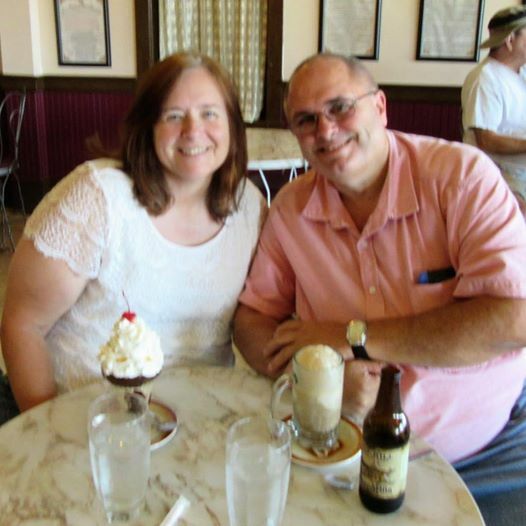 Though we checked out a few other buildings at Boot Hill after a stop in the restaurant, the sweet ending was really our ice cream treats in the on-site eatery. Leaving Boot Hill, we drove past the cattle yards and out to Fort Dodge. Boy, was that a surprise! We both expected the remnants of a fort we could tour like at Fort Scott. I think I would have been less surprised to find that it was a fully operational military base than what we saw. It was not bad. In some ways it was cool, but it was so unexpected, and we didn’t really discover a way to find out why. The “fort” was made up of a building designated as a home for veterans (based on the people we saw, maybe a retirement home). There was a VA facility (health? ), several streets of residential homes (military housing? ), a post office, and a store/cafe/visitor’s center that is only open a few hours a day. This left us with quite a few questions about what Fort Dodge was and why it is what it is today. In our last drive around Dodge City, as we made our way back to where Chewie was staying, Jim and I stumbled upon the Boot Hill Casino. Jim asked, “Do you want to check it out?” I replied, “Yeah.” Jim whipped in to the parking lot, and in a few minutes we were inside. We learned that if we each obtained a player’s card as first-time visitors, we would receive either $30 in free play or $30 of free food each. Of course, we chose free play. When our free play money was used, Jim cashed out $20 (subtract the $1 required to start play), and I cashed out 28.50 (less the $1 to start play). In other words, the casino gave us $46.50 to play for 45 or so minutes there; we walked away with that money in our pockets. Free money is always cool. Once Chewie was picked up, the three of us headed back to the camper. Jim and I had discussed at length all of the wind turbines along each side of the road for several miles just before reaching Dodge City. As I drove in silence (Jim and Chewie were sleeping) this section of road again, it was as if I were moving between the ranks of giant soldiers dressed in white uniforms, twirling their blades daring anyone to enter their domain. Okay, that was a little off the wall, but it is what I thought. Actually, I love the fact that the wheat farms along this stretch of highway are also energy farms.